The State Revolving Fund (SRF) programs have become a well-known financing option for many water and wastewater infrastructure projects across the country. This is mainly due to the longevity of the clean water (CWSRF) and drinking water (DWSRF) programs and the appealing financing options, such as low-interest rates, offered in each state. However, many communities across the country still struggle to obtain this federal money, despite the borrowing incentives, due to capacity at the community level. In 2014, changes in the Clean Water Act permanently added an affordability section to the CWSRF program. On the DWSRF program side, the American Recovery Act of 2009required states to offer additional forms of subsidization to applicants, including principal forgiveness. This brings up the question: What metrics are states using—or should consider using—to determine principal forgiveness eligibility for low-income communities? 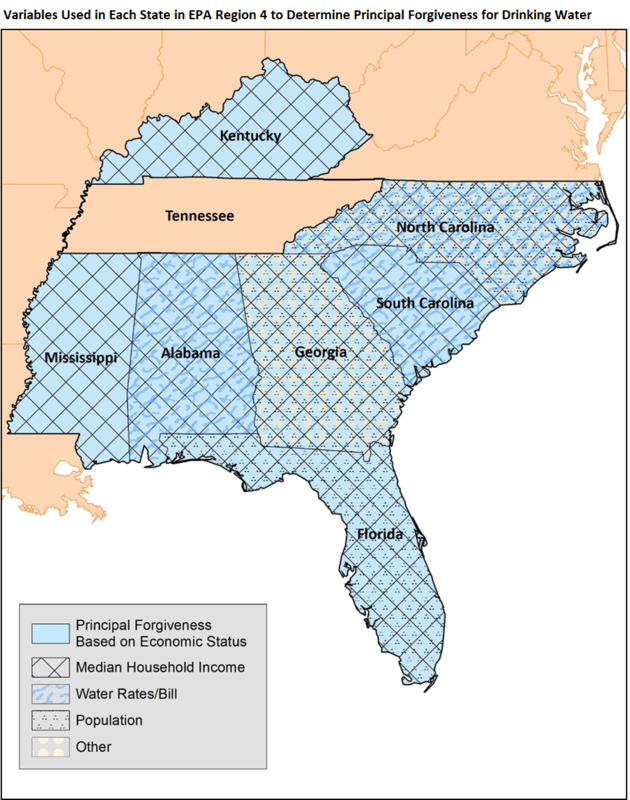 The Environmental Finance Center at the University of North Carolina at Chapel Hill (EFC at UNC) conducted a study in EPA Region 4 to assess the metrics and/or criteria used to determine principal forgiveness eligibility. The methodology consisted of reviewing each state’s most current intended use plan and interviewing program directors/managers of the SRF programs. The most commonly used metric for the DWSRF program in each state is median household income (MHI). This is followed by water rates/bills and population. Other, less commonly used metrics are unemployment rate, number of connections, poverty rate, total appraised value of property, overall finances of a system or applicant, and readiness to proceed. The CWSRF program has fewer commonalities for metrics used. Population is used the most, but not every state uses it. Other metrics used are similar for the DWSRF program, such as poverty rate, unemployment rate, per capita annual income, MHI, economically distressed area, number of connections, utility rates, total appraised value of property, finances of a system or applicant, and readiness to proceed. Principal Forgiveness Based on Economic Status for this study, is defined as the state including disadvantaged or low-income communities in their criteria for determining principal forgiveness eligibility. For the definition of “Other,” see the paragraph above. The number of metrics available to states to determine low-income eligibility is ample. Therefore, states are encouraged to perform a sensitivity analysis to determine each metric’s impact on the overall criteria for principal forgiveness eligibility. This can also help states assess whether two metrics correlate strongly with each other. Thus, if two variables correlate strongly, there is a higher chance that a community will be rated similarly on both measures. If overlapping does occur, then a state could discuss and further research which metric would give better insight about the communities in the given state. States should also take into consideration any relevant legislation, such as the Water Resources Reform and Development Act of 2014 (WRRDA). After the impact of metrics are determined and legislation is reviewed, then the state should consider whether or not different metrics should be weighted. With recent interest and efforts in affordability, some states in Region 4 have redesigned or are in the process of redesigning their criteria for selecting applicants for principal forgiveness. The Georgia Environmental Finance Authority is currently looking at other metrics for their SRF programs. Currently, Georgia’s SRF program examines MHI, unemployment, and population. In North Carolina, the Environmental Quality’s Division of Water Infrastructure is also actively working on changing their affordability value in their priority list ranking process to match the state program. Additionally, Kentucky’s Infrastructure Authority and Energy and Environment Cabinet’s Division of Water plans to have a standard household income survey in the upcoming months and are reevaluating their criteria for low-income applicants. The SRF program’s design is for perpetuity. Therefore, principal forgiveness should be thoughtfully allocated to loan applicants in each state’s SRF program. Because of today’s readily available data banks, states have the opportunity to choose which metrics best define the threshold for affordability in their communities. 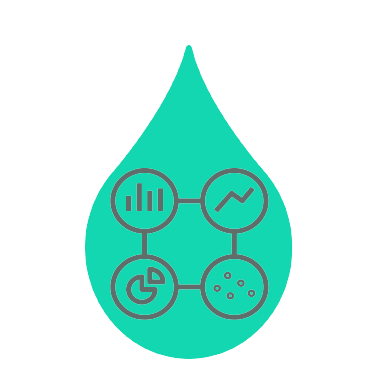 For more information and resources on addressing water and wastewater affordability challenges, please visit https://efc.sog.unc.edu/water-affordability-tools. Special thanks to Stacey Isaac Berahzer and Daniel Irvin for contributing to this post. Water Resources Reform and Development Act of 2014, Pub. L. No. 113-121, 128 Stat. 1325 (2014). Though the option to offer assistance to “disadvantaged communities” had long been an optional feature of the program. Water bills and rates are measured at 5,000 gallons per month. Type of population varies from “service area population” to “population change.” Population change is measured at the state or local level (loan recipient) within x number of years. Written by Claudia Flores. Claudia is the Project Coordinator at the Environmental Finance Center at the University of North Carolina at Chapel Hill.